To assess the impact of intravenous isotonic and hypotonic maintenance fluid on the risk of delirium in adult postoperative patients, we conducted retrospective before-after study in a tertiary teaching hospital. We examined all adult patients admitted ICU after an elective operation for head and neck cancer, or esophageal cancer from February 2014 to January 2017. From February 2014 to July 2015, patients were administered hypotonic fluid (sodium; 35 mmol/L) as the National Institute for Health and Care Excellence (NICE) have recommended. From August 2015 to January 2017, patients were administered isotonic fluid (sodium; 140 mmol/L). We defined the incidence of delirium as the primary outcome. The delirium was defined as the Intensive Care Delirium Screening Checklist during the ICU stay ≥ 4. A propensity score-matched model was used to adjust confounders. As postoperative intravenous maintenance fluid, hypotonic fluid was administered to 119 patients and isotonic fluid was administered to 92 patients. Among those total cohorts, the incidence of postoperative delirium in the hypotonic group was 21.8%, which was significantly higher than that (9.8%) in the isotonic group (p = 0.019). After propensity score matching, we selected 77 patients in each group. The incidence of delirium during the ICU stay in the hypotonic group was 26.0%, which was significantly higher than the incidence of 11.7% in the isotonic group (p = 0.023). 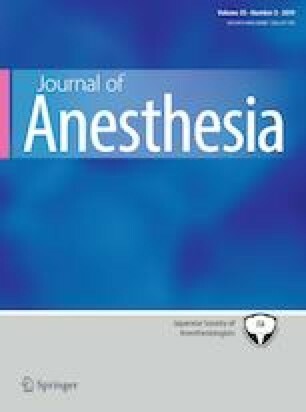 In this study, the use of postoperative hypotonic maintenance fluid was associated with a higher risk of postoperative delirium than that when isotonic maintenance fluid was used. The online version of this article ( https://doi.org/10.1007/s00540-019-02626-4) contains supplementary material, which is available to authorized users. This work was supported by Grant-in-Aid for Scientific Research (18K16448). All authors concur that there is no conflict of interest with regard to manuscript. M.N. : Study conception and design, acquisition of data, analysis and interpretation of data, drafting of manuscript, and critical revision of manuscript; M.E. : Study conception and design, acquisition of data, analysis and interpretation of data, drafting of manuscript, and critical revision of manuscript; N.F., M.O. and S.M. : acquisition of data, analysis and interpretation of data, drafting of manuscript, and critical revision of manuscript; SM: Study conception and design, interpretation of data, and critical revision of manuscript; All authors read and approved the final manuscript.